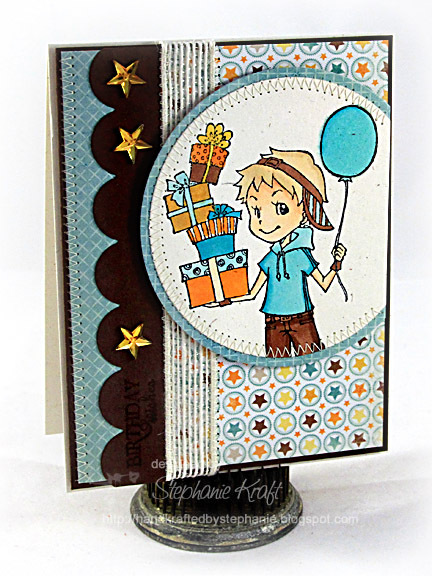 HandKrafted by Stephanie: Sparkle Creations January Preview -- Birthday Josh! 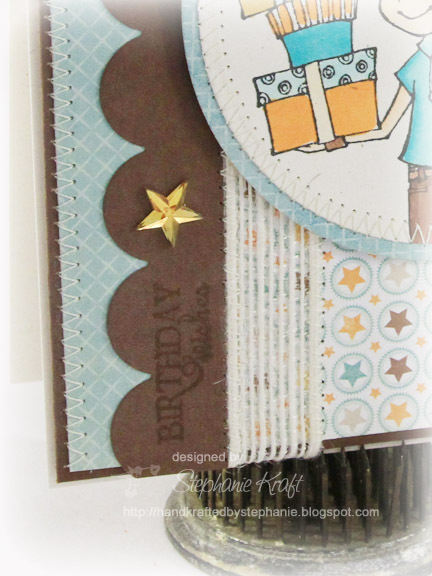 Sparkle Creations January Preview -- Birthday Josh! Hello and Welcome to the first day of previews for the Sparkle Creations Rubber Stamps January release! Sparkle is releasing 2 new images at midnight EST this Saturday, January 8 .. Today we are previewing Birthday Josh! I almost didn't recognize Josh without his headphones! He looks to be off to a birthday party here, doesn't he? I paired him with some paper from My Mind's Eye (Fine and Dandy True Blue) and added some star rhinestones from Pizzazz Aplenty. I stamped the sentiment "Birthday Wishes" in Versamark Watermark for a subtle effect -- see below (I had to lighten the detail shot quite a bit for it to show up on the Dark Chocolate cardstock). 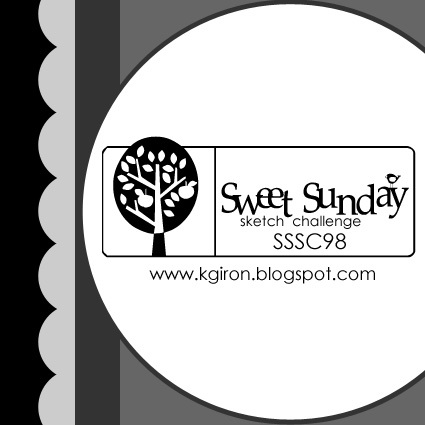 I used Karen's Sweet Sunday Sketch #98 for my layout. Be sure to visit her and the rest of the SCRS designers for more peeks of Birthday Josh. Sparkle will be giving away a Birthday Josh to one lucky person! For a chance to win, you need to comment on all of the designer's blogs (list below). Then head on over to the SCRS blog and comment on the Josh post. You have until midnight EST each day to comment. The lucky winner will be announced the following day! Accessories: Standard Circle Nestabilities (Spellbinders), Medium Scallop Die (Papertrey Ink), Markers (Copic), Rhinestone stars (Pizzazz Aplenty), Jute ribbon, Foam tape, Thread, Sewing machine. What a darling card! I love the stars! Your card is adorable!! love the paper. love you sketch and love your coloring, love your paper - love it all! What a cute card! Love Birthday Josh stamp! So sweet, love all the stars! Wonderful card! Your stitching is so perfect! Lovely card. Reminds me that I should use more stitching on my cards. Great job and paper selction. Looks like one of my boys! Haha! I didn't even notice the headphones! Love the MME paper and your work on the sketch. Such a fun image and sweet card! YOu are so good at pairing the images with sketches and papers!